DURHAM, NC (August 16, 2018) - Brandt Snedeker wasn’t the only one dropping birdies and breaking records today in North Carolina. Kelly Stimart and Johnny Elam of Charlotte, N.C. put on their own show only a couple hours away from the Wyndham Championship at the 18th North Carolina Senior Four-Ball Championship at Old Chatham Golf Club in Durham, N.C. The duo started the final round at 12-under-par and found themselves two shots back of the leaders and their playing partners, Steve Harwell of Mooresville, N.C. and Patrick Brady of Reidsville, N.C.
Stimart and Elam went out with seven birdies and two pars to shoot a 7-under, 29 on the front nine. They started the back nine with a bogey on the 10th hole but quickly got back on track with a bounce-back birdie on the 11th hole. They made three more birdies in route to a 10-under-par, 62 to win championship. Their 22-under-par, 194 total for the tournament was capped off with a birdie by Elam on the final hole giving them a two-shot victory. The team of Gary Hull of Cornelius, N.C. and Randall Sullins of Claremont, N.C. also started the day two shots off the lead, but after a hot start with six birdies on their first six holes, they had an early two-shot lead. A bogey on the eighth hole slowed down the momentum for Hull and Sullins. They only made three more birdies on their last 10 holes to finish at 8-under, 64 for the final round. Their 196 total for the three rounds was enough for second place in the championship. The 36-hole leaders, Brady and Harwell, shot a respectable 5-under, 67 in the final round but it wasn't enough to keep up with the birdie barrage. They finished the championship in third place. 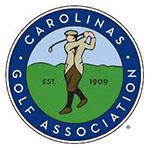 The Carolinas Golf Association would like to thank Old Chatham Golf Club for hosting the 18th North Carolina Senior Four-Ball Championship. Thank you to all the members and staff for allowing the use of their fantastic facilities and for all of their hard work during the event. A special thank you is extended to Director of Operations, John Marino and Director of Grounds, Brian Powell. Old Chatham Golf Club is the host club for the 2019 US Senior Amateur Championship that is scheduled to be played in August 2019. Open to any male golfer aged 55 and older, a legal resident of North Carolina, and an active index with the CGA. Format is 54 holes of four-ball stroke play with the field cut to the low 30 scores and ties after 36 holes.